“Lucky” (2017). Cast: Harry Dean Stanton, David Lynch, Ron Livingston, Ed Begley Jr., Tom Skerritt, James Darren, Beth Grant, Barry Shabaka Henley, Yvonne Huff, Hugo Armstrong, Bertila Damas, Ana Mercedes. Director: John Carroll Lynch. Screenplay: Logan Sparks and Drago Sumonja. Web site. Trailer. Living life as a recluse in a small town in the Arizona desert is almost as barren as the surrounding landscape. So it is with Lucky (Harry Dean Stanton), a retired World War II Navy cook who has outlived nearly everyone he has ever known. By all rights, outsiders might wonder how he’s managed to live so long, too, given his nearly incessant chain smoking and routine alcohol use. It’s a complete mystery to his doctor (Ed Begley Jr.), who tells the nonagenarian that, by most measures, he should have keeled over a long time ago. Yet somehow Lucky keeps going, probably thanks to his robust walking and yoga regimens, practices that seem to keep him surprisingly healthy for his age. Some would say that’s what makes Lucky lucky. 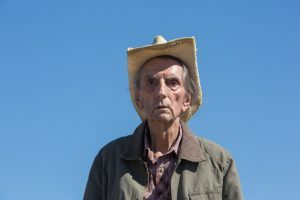 Ninety-year-old atheist Lucky (Harry Dean Stanton) comes face to face with the meaning of life in the thoughtful new cinematic meditation, “Lucky.” Photo courtesy of Magnolia Pictures. A wrinkle occurs, however, when a minor unexpected, unexplained health incident strikes Lucky, leaving him and his physician perplexed. With no apparent cause for the episode, Lucky is left to figure out what caused it. But, as he gradually comes to discover, what’s more important than its cause is why it occurred in the first place. In the wake of this incident, Lucky realizes that he must come to grips with the meaning of life, especially now that its end may be nearing, a preview of which the health scare provided. But, as someone who has long put off ruminating on such issues, Lucky is unsure of how to proceed. What should he look for? Who should he turn to for advice and guidance? And will he recognize the answer when he finds it?  That may be rather challenging, given that, as a longtime atheist whose general outlook on life is somewhat dour, he seems to hold out little hope for happiness and salvation, both for himself and mankind in general. Through a series of everyday encounters that prove to be deceptively insightful, Lucky begins to see glimmers of the insights he’s been looking for. 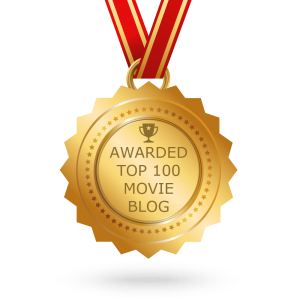 These include conversations with the jovial owner of a local diner (Barry Shabaka Henley) and his kindly waitress (Yvonne Huff); a chance meeting with a fellow World War II vet (Tom Skerritt); frequent interactions with the staff and patrons of a local nightspot (Beth Grant, Hugo Armstrong, James Darren); two intense confrontations with an estate planning lawyer (Ron Livingston); a birthday celebration with a convenience store clerk (Bertila Damas) and her sweet mother (Ana Mercedes); and several dialogues with an aging gentleman obsessed with the disappearance of his elderly pet tortoise (David Lynch). 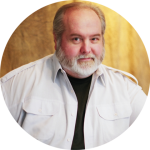 These seemingly innocuous encounters lead to personal revelations that shed light on the protagonist’s mindset – and what he might want to do with it as he heads into his own future. 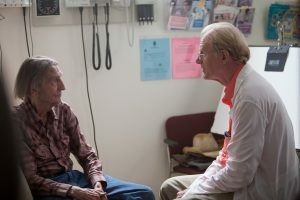 Amazed at his 90-year-old patient’s remarkable health, Dr. Christian Needler (Ed Begley Jr., right) discusses the regimens employed by Lucky (Harry Dean Stanton, left), a spry but reclusive retired military vet, in director John Carroll Lynch’s debut feature, “Lucky.” Photo courtesy of Magnolia Pictures. Lucky is indeed fortunate to have been given the gift of time to sort things out in his life. And, considering that he’s put off doing so for so long, he’s lucky that he has still has the opportunity to figure out matters while he still has the chance. It’s something many of us never get around to, but, fortunately, Lucky seems to be getting it in under the wire. And, as his situation thus demonstrates, better late than never. As Lucky embarks on this personal journey, he makes his first forays into the subject of conscious creation, the philosophy maintains we manifest the reality we experience through the power of our thoughts, beliefs and intents. Like so many of us, Lucky appears to have spent much of his life drifting through it, engaged in its experiences but not really making much of an effort to understand it. He’s observed his existence rather superficially, looking at its surface qualities but never probing what lies underneath them or how they have come into being. By focusing his attention on these attributes, he doesn’t see beyond what’s present at purely face value. And, even though he’s managed to make it through much of his life relatively unscathed (as his nickname suggests), he’s nevertheless seen his share of others’ pain, suffering and frustration, not to mention the scams that people often unscrupulously perpetrate against others. It’s no wonder that his outlook is rather bleak, and it probably accounts for his belief that divine grace is nothing more than a myth. However, given his present circumstances, Lucky now finds himself with an incentive to change direction. He has created conditions, even if unknowingly, that enable him to address the questions he’s long been putting off. And it proves to be an eye-opener, leading Lucky to discover aspects about life – and existence – that he never before considered. He may be coming to these realizations rather late in the game, but, again, better that he get the lesson than not. 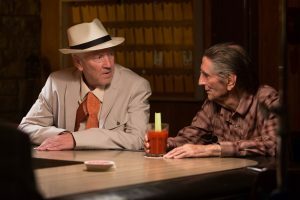 In his search for the meaning of life, 90-year-old Lucky (Harry Dean Stanton, right) discusses the subject with his friend, Howard (David Lynch. Left), whose primary focus is on the whereabouts of his missing pet tortoise, in “Lucky.” Photo courtesy of Magnolia Pictures. To a certain degree, this probably helps to account for his otherwise-inexplicable longevity. On a subconscious level, Lucky may well have understood that he would one day have to examine these big questions of life, reluctant though he may have been to do so. To compensate for this, he thus manifested the gift of time to himself, enabling him to continue living until the time when he was finally ready to take on this task. In this regard, he was practicing his own form of conscious creation without even realizing it, giving himself what he needed until he was prepared to tackle the lesson he knew he would eventually have to address. This represents an excellent example of using this philosophy in a highly practical way, one that effectively gets us what we need when we need it and in a generally inoffensive way at that. Of course, with his personal odometer passing the 90-mile mark, Lucky also likely realized – again subconsciously – that he needed to get down to business on his introspective odyssey. And that’s where the manifestation of the health scare comes into play. It’s a self-inflicted psychic nudge to shake him out of his longstanding complacency, to finally get serious about what he has long ignored. The episode itself was nothing dire or life-threatening, but it was sufficiently noticeable enough to grab his attention and set him down the path he subsequently pursues. This is another example of Lucky’s blossoming conscious creation skills, the manifestation of a springboard event that pushes him to look at his life more intently and more profoundly than he probably ever has in his 90 years on earth. His experience thus proves that it’s never too late to start something new – and that indeed is possible to teach an old dog new tricks. 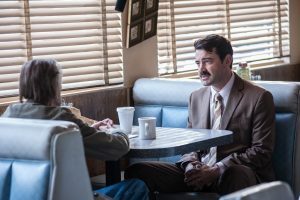 A tense confrontation between a 90-year-old atheist, Lucky (Harry Dean Stanton, left), and an estate planning lawyer, Bob (Ron Livingston, right), leads to some surprising insights for the searching nonagenarian in the thoughtful new cinematic meditation, “Lucky.” Photo courtesy of Magnolia Pictures. Though sometimes a little too cryptic for its own good, this otherwise-reflective meditation on life, existence, mortality and human relations provides viewers with much to ponder about the state of one’s reality and how it’s shaped. With an excellent, career-topping performance by the late Harry Dean Stanton, coupled with a strong supporting ensemble, this quiet, low-key debut feature from actor-director John Carroll Lynch explores the meaning of life and the secrets to help make it fulfilling, both while we’re here and as we’re about to make our ultimate transition. Like the circle of life so aptly addressed in this offering, “Lucky” fittingly represents a promising first effort from a filmmaking newcomer and the crowning achievement of a veteran performer’s repertoire, all wrapped up in one thoughtful, beautifully filmed package. Taking time to take stock of our existence, even when the clock is about to get us, is always a worthwhile pursuit. And, like the hero of this quiet drama, should we find the answers we seek, we, too, could readily consider ourselves lucky.